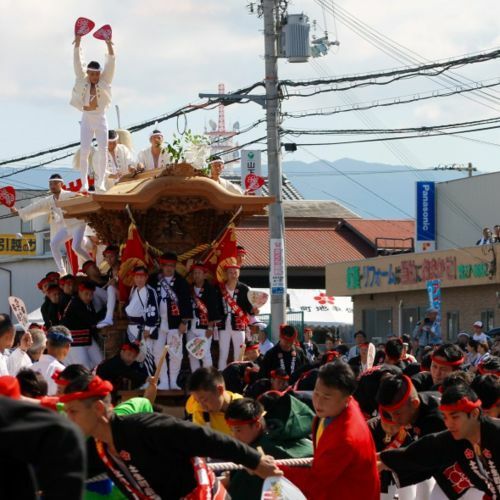 Sakai, a city south of Osaka, has played an important role in shaping Japan. During the Sengoku era (1467-1603), Sakai was a port city and hub of trade with ties to Spain, Portugal, and China, as well as other European and Mediterranean countries. Sakai is not only known for its history as a flourishing merchant city, but also for its refined Japanese tea ceremonies and production of high-quality knives. Sakai Uchi, the name of the city’s world-renowned, traditional style of knife making is praised for its quality, durability and sharpness. It is said that this particular kind of knife was invented for the purpose of cutting tobacco, which was traded and imported from Portugal in the 1600s. To this day, Sakai knives are popular among chefs, especially when preparing fine cuts of sashimi.Founded by Torakichi Mizuno in 1872, Mizuno Tanrenjo has a long history of knife making. Here, I met Atsushi Mizuno who welcomed me and took me into his sacred working quarters. He displayed the Mizuno Tanrenjo sword making technique which has been passed down by four generations of the Mizino family. 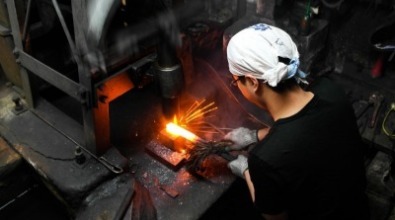 Mizuno Tanrenjo knives go through a process called “kata-ba-haganetuki-houcho.” After a quick tour of his studio, Atsushi began his forging by placing a plain piece of steel into the furnace, then heating it up to 900 Celsius. After heating, the piece of steel was taken out of the furnace to form the handle of the knife. Mizuno pounded the steel with a pedal-activated machine and handheld hammers. As someone who has no experience with knife making, this was the moment things got exciting. He told me to watch carefully. Sparks flew, smoke rose and the sound of metal hitting metal resounded in his forging chambers. There was a brief moment of silence, which was disturbed by a sizzle as a piece of the hot steel was cut and placed into water to cool. This piece was then joined to a longer piece of steel with iron powder. After joining the pieces, he put them right back into the furnace. I asked him how long this whole process takes. “About 30 minutes,” he said as he continued working diligently. Paying careful attention to detail, Atsushi shaped the piece of steel into his desired form. I was able to witness a craftsman at work using the knowledge and traditions of his ancestors. The final step was the forging process, which was followed by cooling in ash to prevent irregularities. He brought out another steel piece which was in the final stage of the knife making process to compare. We then headed out toward the shop to view his family’s works. I was impressed by his speed, precision and accuracy. Crafting a knife of quality, such as the ones the Mizuno family produces, takes a lot of concentration, dedication and, oftentimes, pain. I wondered how many times he had hurt himself while learning his skills or even more recently while working. 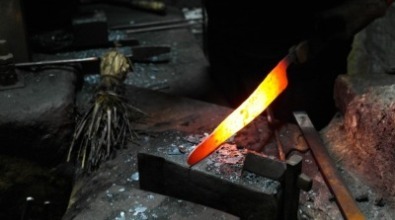 Knife making is no easy job and it requires the skill of a professional. Atsushi Mizuno was trained in knife making from a young age, mainly out of necessity in order to preserve his family’s long-standing traditions—a tradition that will no doubt be carried into future generations. 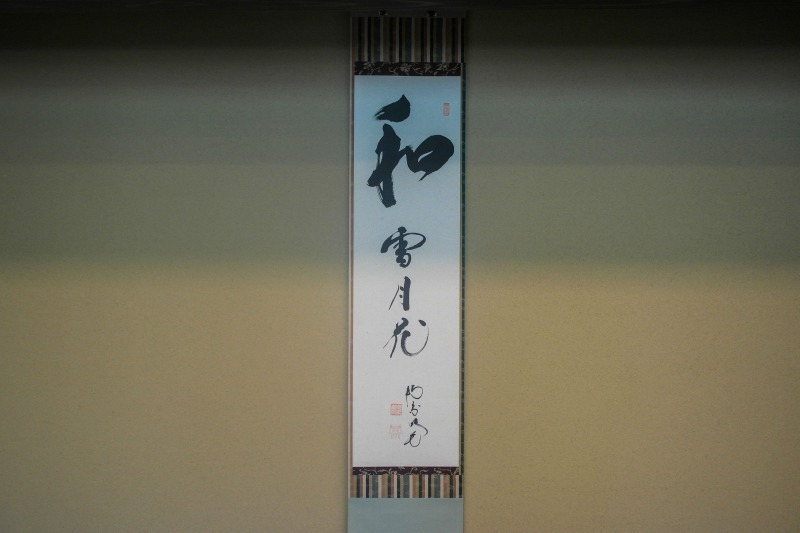 Whether you’re a chef looking to buy high-quality knives or just someone who appreciates fine works of craftsmanship, you can visit him Mizuno and his family’s shop in Sakai to witness this region’s traditional knife making. From Namba Station take a train on the Nankai-Airport Line to Shichido Station. The walk to Mizuno Tanrenjo is about nine minutes away. 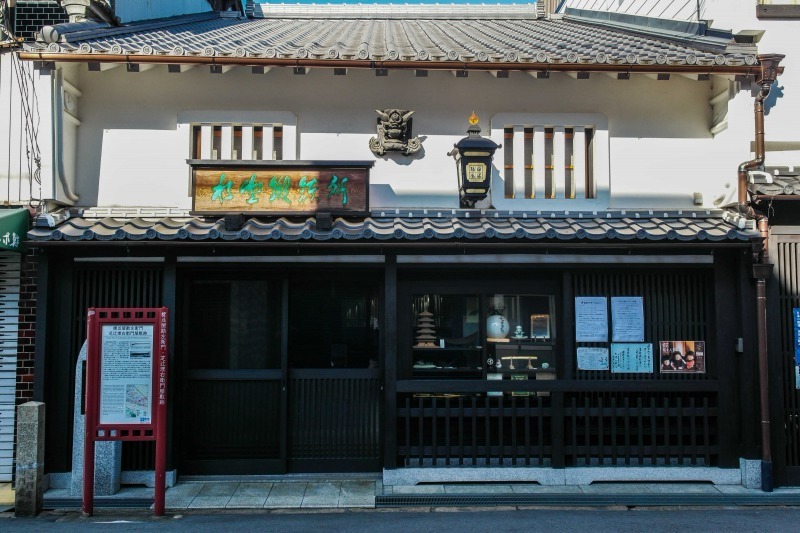 A few stops away by trolley is a place which houses the traditions of Sakai’s past, Sakai Risho No Mori. Despite its modern design, in this hall one can learn about Sakai and its pivotal role in Japanese history and culture, including Japanese tea ceremonies. A prominent figure in the world of tea ceremonies was a man named Sen no Rikyu. Rikyu was born in 1522, during the Sengoku era, and was a major influence on Japanese wabi-cha style tea ceremonies, which emphasized simplicity in its practice. This concept gave way to the Japanese term wabi-sabi, the idea of finding beauty and value within something imperfect, simple and fleeting. Other words associated with wabi-sabi include asymmetry, flawed-beauty and authenticity, in addition the notion of embracing silence. Embodying a variety of emotions, wabi-sabi has no English translation and is probably best felt rather than defined. One Japanese word that expresses the idea of wabi-sabi is ichigo ichie, which translates to “once in a lifetime opportunity.” This goes beyond a literal meaning by explaining that wabi-sabi moments don’t last and should be valued, not taken for granted. 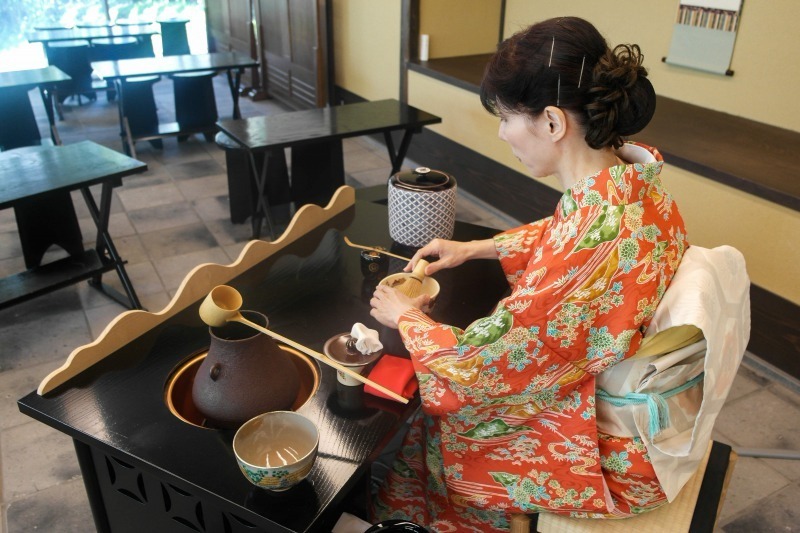 At Sakai Risho No Mori you can experience wabi-sabi within the tea ceremony exhibition room, where a highly experienced tea practitioner performs the art of a Japanese tea ceremony. While she elegantly prepares and serves the tea, one can witness the true essence of a wabi-cha tea ceremony and feel wabi-sabi in silence. Japanese tea is served to all guests. The combination of the fine bitter taste of the green tea and sweetness from this momiji—a maple-leaf shaped wagashi (traditional Japanese confectionary)—complimented each other well. The only decoration in the tea room is a scroll or vase of flowers. The absence of decoration opens the senses up to appreciating simplicity in the moment. Major figures and practitioners of tea ceremonies throughout history. 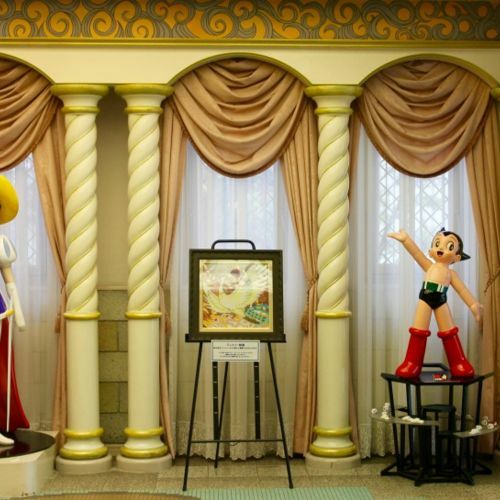 In the Sen no Rikyu Cha No yu Museum, you can take a walk through the history of Sakai. I highly suggest going into the theater room where you can watch a short video on Sakai and Sen no Rikyu. After leaving the Sakai Rishi no Mori and taking in this hsitory, I was moved by the life of Sen no Rikyu. Although he was ordered to commit seppuku (ritual suicide) by Toyotomi Hideoyoshi due to personal disputes, his ideologies live on within Japanese culture and society.Sen no Rikyu wanted his practice of Japanese tea ceremony to stray away from the superfluous materiality of society. This reminds us to also do the same, to enjoy the simple things and value the transient moments in our lives. Take the tram bound for Hamaderaekimae, from Ayanocho Station to Shukuin Station. 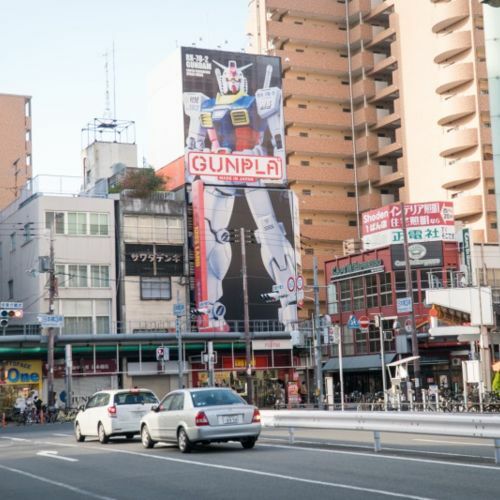 From a small city of Hawaii now living in my favorite city Osaka for 3 years, Chris is now touring Japan and seeking for life's answers through his travels. Come follow him on his adventures!